Malachite is a rare, semi-translucent green volcanic crystal. It is used to create high-quality glass weapons and light armor. As mentioned in the book Light Armor Forging, this glass bears no relation to the common, brittle type of glass used in windows and ornaments, or in the construction(HF) of houses. See the lore article for general information. 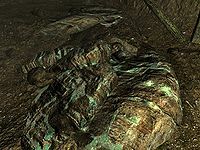 The only Malachite mine in Skyrim is located in Steamscorch Mine, outside of Kynesgrove in Eastmarch. 3 Malachite Ores are obtained by mining Malachite Ore Veins. 1 Refined Malachite ingot is obtained by smelting 2 Malachite Ores. Glass Smithing requires 70 Smithing skill. Glass Armor is level 36 Light Armor, made from Refined Malachite, Refined Moonstone, Leather, and Leather Strips. Glass weapons are level 27 weapons, made from Refined Malachite, Refined Moonstone, and Leather Strips. Refined Malachite may be sold by blacksmiths starting at level 18 and general goods merchants starting at level 10. Malachite Ore may be randomly found in Falmer loot starting at level 7. These ore vein locations are also listed in the Malachite Veins category, and the exterior ore veins are shown on (map). Eastmarch Steamscorch Mine 7 2 3 The mine is immediately northeast of Kynesgrove; see Steamscorch Mine for details. One of the ores and all ingots are owned. Glass Smithing is the third perk in the "light armor" branch of the Smithing skill's perk tree; if you have both Dragonborn and Dawnguard, it is the only perk that does not apply to any sort of heavy armor. Unlocking it requires a Smithing skill of 70, and the Advanced Armors perk must have already been unlocked. Glass Smithing allows both Glass Armor and Glass Weapons to be crafted. The Glass Smithing perk also causes tempering of Glass weapons and armor to be twice as effective. This perk applies to both unenchanted Glass gear and enchanted gear (generic armor, generic weapons, or custom), as long as the Arcane Blacksmith perk has been unlocked. Tempering of a couple other items is also improved by Glass Smithing, namely: Chillrend and Grimsever. 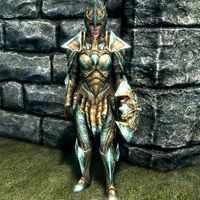 Glass armor is the third "best" light armor, behind Dragonscale and StalhrimDB light armor, although it offers worse armor per weight than Elven armor. It appears in leveled lists starting at level 36 (enchanted varieties at level 37). All items can be tempered using Refined Malachite, and having the Glass Smithing perk doubles the quality improvement. Notably, the glass shield is the lightest shield in the game that will reach maximum damage reduction against non-power attacks when using unfortified Block. 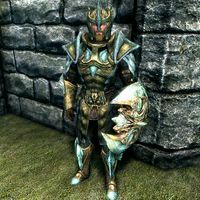 Glass Weapons are the fifth best weapons, behind Dragonbone, Daedric, StalhrimDB, and Ebony weapons. They appear in leveled lists starting at level 27 (enchanted varieties at level 28). All items except ammunition can be tempered using 1 Refined Malachite, and having the Glass Smithing perk doubles the quality improvement. Arrows can only be smithed if the Dawnguard add-on has been installed. † The base gold value used for all generic enchanted versions of the Glass Bow is 287 instead of 820. Similarly, enchanted Glass Swords have a base value of 205 instead of 410. This means that the enchanted weapons are 533 (bow) or 205 (sword) gold cheaper than they should be, and in several cases are cheaper than the unenchanted version. This bug is shared by several types of bow in the game. 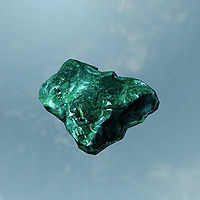 Malachite Ore can be sold to Kjeld for the quest Mine Ore.
1 Refined Malachite is needed to temper the dragon mask Otar. 1 Refined Malachite is needed to temper the weapons Chillrend and Grimsever. Ore veins (all types) sometimes do not respawn normally. See Mining (Bugs) and elsewhere on that article and its talk page. 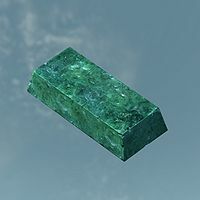 The in-game material Malachite shares its name with the real life copper ore called malachite, Cu2CO3(OH)2. The Elder Scrolls' malachite was likely named after the real world material for the blue-green hue shared. This page was last modified on 2 August 2018, at 23:15.